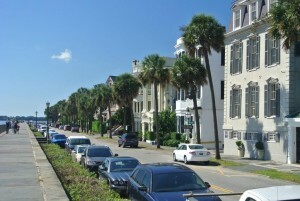 During the last week, I had a meeting requiring my attendance in Charleston, SC. Of course, my friends and family were very concerned for my safety, given the recent news of rains and flooding from South Carolina. So, I called the hotel in Downtown Charleston, and they assured me that the flood danger had passed, and that the airport, hotel, and the route between the two were in no danger. Whew! So I flew off to Dixie for a few final days of summer weather before hunkering down for our more seasonal autumn. As I have mentioned in the past in this blog, I enjoy undertaking a run on my first morning in a new city – It orients me to the local roads, sights, and geography, and should further opportunities for exploration come up. I have some idea where I might want to go. Also, a good run is a great way to chase the travel stiffness from my legs. So on a warm, clear southern morning, I set off on a run. 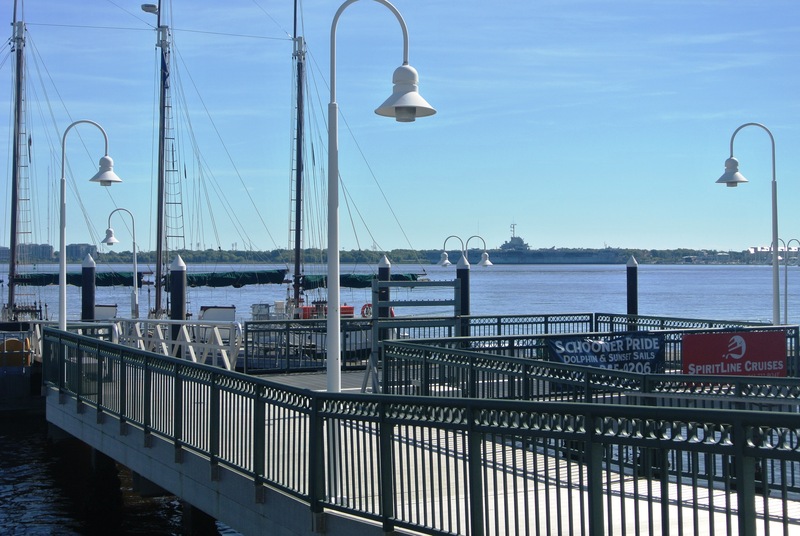 The touristy section of Charleston, where I was staying, is on a lowland peninsula, bounded by the Cooper River on the east, and the Ashley River on the west. My hotel was adjacent to the central square, celebrating “The Swamp Fox”, Francis Marion, who led much of the colonial resistance against the British in South Carolina during the Revolutionary War. 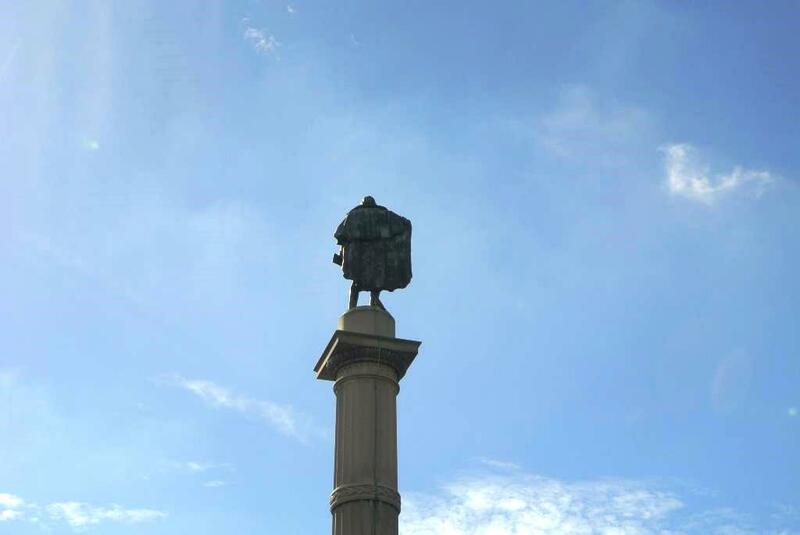 I noticed the monument celebrating General Marion at the start of my run, and from my perspective, he seemed to be flashing the southern part of the peninsula, home of the most aristocratic of the city’s population, then and now. 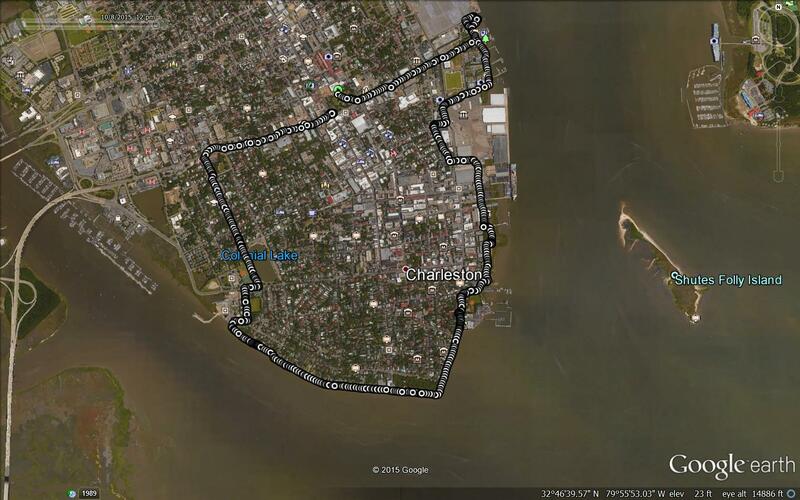 I began my run heading east towards the Cooper River on a street named after one of the strong early defenders of state’s rights, and the institution of slavery, early 19th century Vice President John Calhoun. 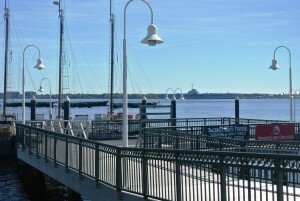 Reaching the waterfront, I noticed a mix of uses- industrial and tourist-oriented. I could see an aircraft carrier across the bay, and later found out that this was the WWII-vintage USS Yorktown, which confused me, as I had learned in history classes that the Yorktown had been sunk in the Battle of Midway. Apparently, this carrier was built a year later, and christened with the same name in honor of its sunken predecessor. Continuing south along the east side of the peninsula, I passed through some of the most beautiful homes in the city. 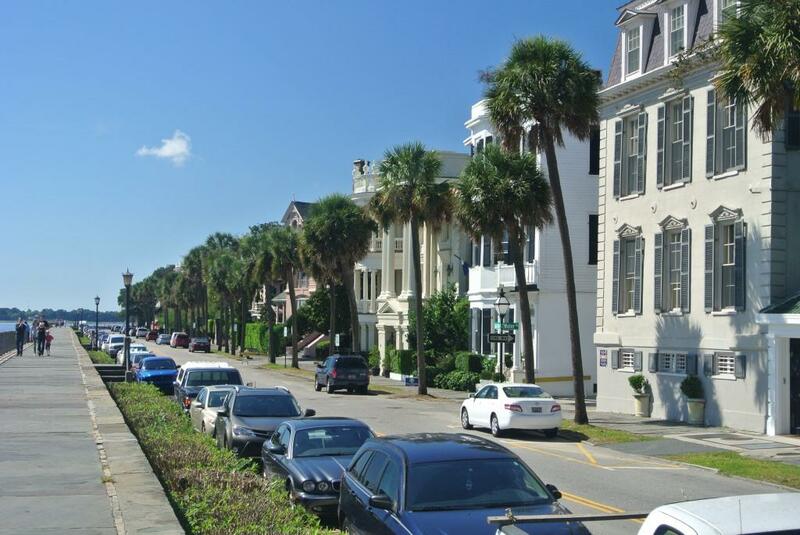 Charleston is known for its architectural preservation, which I noted in both the tonier, as well as the poorer neighborhoods just to the north of my hotel. Well, these homes on the southeast shores, not unlike waterfront properties in most well-off neighborhoods, were beautiful and well-preserved. Continuing south, I came to the far southern tip of the city, the fortification known as “The Battery”, where I could spy the flag waving over the distant fortifications of Fort Sumter. 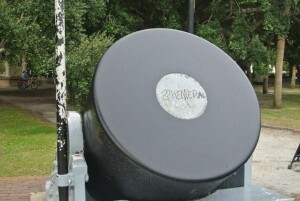 Cannons, with a curious graffiti message were poised on The Battery, but these were not the guns used to shell Fort Sumter, which was still several miles out into the bay and out of their range. Rounding the horn at the battery, I headed north up the somewhat less scenic Ashley River for a short distance to return to Calhoun St. 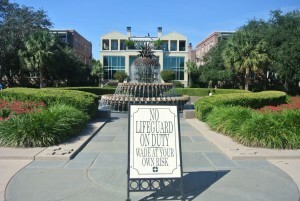 This time, my trip back to my hotel passed through the campus of the College of Charleston. This campus is a beautiful mix of the “Old South” with shady streets and moss-covered trees, despite its urban setting. There was one disconcerting observation however; Namely, here I was at a state-supported school in the deep south, in a state with a sizeable African-American population, and I barely saw any students of color any where on campus. My New England liberal brain kicked in, and I started wondering if this was some artifact of Jim Crow laws, in a state which also has historically black universities? As a reality check I looked at the numbers; about 5% of the students here were self-identified as African-American in a state where close to 30% of the population is African-American. This was worrisome, but before I got too smug about it, I compared these numbers with those from Ohio State University, and the even more progressive (at least by reputation) University of Michigan, two northern flagship state universities in states with large minority populations. As it turns out, their percentage of students of color is no better. I can’t blame this on the old south – it is a seemingly universal challenge in higher education. 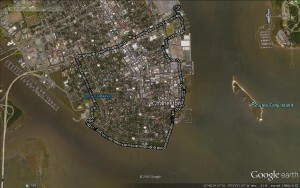 Finishing the run, I got back to my hotel, making this a slightly over 5 mile run, with a lot of stopping for photos. I am not going to bother showing the altitude profile, as stepping up onto the sidewalk is probably the biggest climb I saw on this run.